Armstrong Pumps introduces the Series 6000 HYDROPAK line of packaged booster systems. Series 6000 HYDROPAK applications include commercial, high rise, industrial and other installations requiring a boost in water pressure. 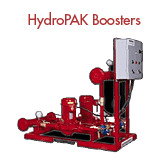 The Series 6000 HYDROPAK fulfills the need for an engineered, compact, ready to install and factory tested booster system. Responding to flow & pressure demands, the HYDROPAK is equipped with an autonomous, state of the art control system that provides uninterrupted, unattended pump operation in the most energy efficient way.